Inergetics Surgex® Sports Nutrition – As a newly developed and publicly traded company, it was important for Inergetics to promote brand awareness for customers and communications for share holders. 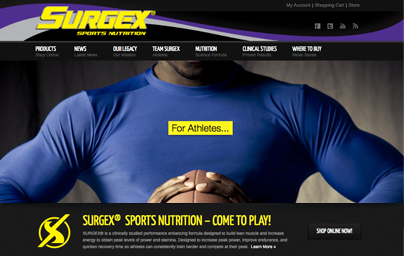 In early 2013 we launched the new Surgex® Sports website which included a robust eCommerce system, site design, programming and development. 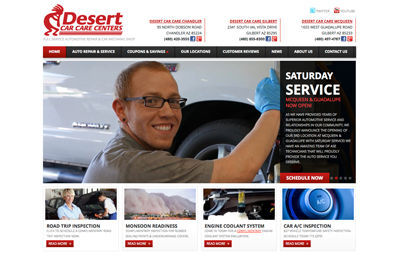 Desert Car Care – Starting with a new site design and developed in WordPress, we were able to expand the user experience and increase scheduling of online appointments. Search engine optimization (SEO) was implemented to target localized search results. Social media and Youtube was also updated and managed to include direct communications from each individual location for promotions and car repair news and automotive education. 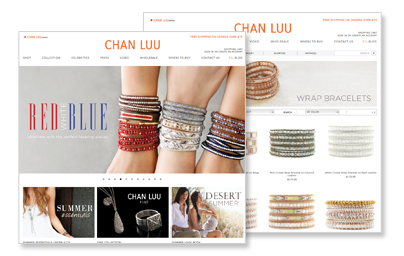 Chan Luu® – As a Los Angeles based fashion jewelry designer, Chan Luu came with the requirements of increasing their fashion jewelry sales online. Typical sales have been through brick and mortar stores including Nordstroms, Banana Republic and Macy’s. Our first project approach was creating an eCommerce system through BigCommerce and customizing the user experience and incorporating search engine optimization and marketing. Andexler.com was created with a shared vision to build superior interactive design solutions. We harness the power of ideas and human themes as a fulcrum that breaks through mediocrity and strives to constantly engage and motivate ones imagination and feelings. Through building insatiable curiosity and deeper relationships with each individual consumer we empower the communication process by causing consumer-driven interaction.